Duterte pulling out of the ICC is a natural and foreseeable occurrence. Bound to happen. Inevitable. Strongmen of all ilk and circumstance — (pseudo)democratically elected or otherwise — have an aversion to the rule of law. It is pesky, inconvenient, messy. It gets in the way of governing (generously put) by fiat, capriciously, and extra-judicially. With the ICC daring to investigate these types for their facially criminal conduct which hazardously (and in their minds, unjustifiably) could result in charges and prosecution, is it not predestined (instinctive) that they, in holding themselves above the law (or the law, as Duterte seems to have claimed in promoting and justifying his extra-judicial killings in combating drug dealers and drug users), would denounce, deprecate, and depart from the ICC, posthaste? 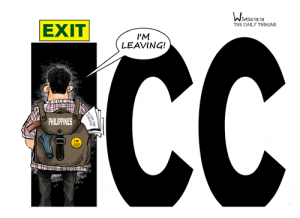 Realistically, Philippinexit is unlikely to be raising significant concerns among States Parties or the international community at large, even though other States may follow suit. For a while it looked like many of the African States would walk away from the ICC (raising significant concerns given the numbers involved and attendant consequences) because in their view (justifiably) the ICC was targeting Africans at the exclusion of investigating, charging, and prosecuting individuals from other continents. The threat of an African State walk-out by no means has disappeared, even if their appetite for doing seems to have diminished — for now. Plus, setting up regional courts to deal with impunity (e.g. the Extraordinary African Chambers in Senegal, or the African Court of Justice and Human Rights) is now seen by many African States as just as good a solution, if not a better one, than dealing with the ICC. Where it all ends up and to what extent referring cases to regional courts will impact the ICC’s membership is anyone’s guess. For now, it is not a zero-sum game; ICC membership does not preclude membership in or the pursuit of accountability through regional courts. Not to mention complementarity, which, effectively expects States to deal with impunity at the domestic level – as required by domestic and international norms in any event. Assuming a regional court is properly functioning, resorting to it would satisfy an ICC member State’s obligations in investigating, charging, and prosecuting crimes that fall under the ICC’s jurisdiction. But all of this is old news (see here, here, here, here, and here, here, here, here). And now to my point. The ICC is in no danger from the likes of Duterte withdrawing the Philippines from the Rome Statute. Nor is it in danger from the huffing and puffing of the present US administration, as Bolton and Pompeo would have the ICC (and others) believe. No. The ICC is in danger from itself. For an international judicial institution supported by some 123 States, with a rather impressive budget, fancy state-of-the-art facilities, and legions of support staff with top-heavy academic degrees to support the Chambers, Office of the Prosecutor, and Registry, in its nearly 18 years of existence the ICC has little to show. Yes, statistics can be misleading if taken raw without accounting for much of the intangible good and benefits that have purportedly resulted from the ICC’s existence. And yes, as I’ve noted, the copious acquittals, reversals, and dismissals of cases, which, incidentally, outnumber the convictions on substantive crimes (Katanga and Lubanga) and one plea-bargained admission of guilt (Al-Mahdi), is a good sign that justice is being done — in the sense that if the evidence does not fit the Chambers must acquit — to paraphrase the late Johnnie Cochran. But does this not raise several questions such as: Why so many acquittals? Why is the Prosecution not able to get convictions? Why is the Pre-Trial Chamber confirming charges on evidence that qualitatively and quantitatively, or a combination of both, is insufficient to establish guilt beyond a reasonable doubt of the crimes charged? It is not a matter of being excessively critical or unreasonably demanding of this international judicial institution. It is a matter of fact. The ICC is not functioning well. There are many reasons why it is under-performing. Most are systemic. Swept away in euphoria and irrational exuberance (to borrow a phrase from former Federal Reserve Board chairman Alan Greenspan), the conceptualizers of the ICC may have created, for lack of a better analogy, a Rube Goldberg machine: designing a structurally-flawed international judicial institution that was claimed to be the ideal for yielding ideal international justice. A promise that by all accounts has proved hollow — at least for those who have unjustly or unjustifiably been put through the ICC meat grinder only to be acquitted or have their cases dismissed for lack of evidence. That a rethink of the ICC concept is necessary is beyond question. But is the ICC and are the States Parties capable, let alone willing, to subject themselves to needed brutally painful self-reflection? Are the State Parties willing to make the sort of systemic changes required for a nimble, efficient, and effective ICC? Are the architects of the ICC willing to concede that much too much was placed on the shoulders of the ICC, too many expectations, too wide a mandate, too extravagant of an experiment with too little foresight for the perils that lie in promising more than the institution was conceivably capable of delivering. There is lots to unpack on what has gone wrong and what might be needed to get the ICC-train back on track (in my opinion, a more modest and scaled-back track). Best left for another time. I merely take the opportunity to highlight that the Philippines’ and other States’ departures from the ICC are unlikely to be fatal to the ICC’s future. Rather, the ICC risks dealing the fatal blow to itself from its dysfunctionality, its lack of introspection, and its hubris. It may not yet be midnight for the ICC, but as things are going, that time seems rapidly approaching. Time for the ICC to get its act together, quickly. Anyone interested in an insightful read on the ICC’s failing should definitely check out Douglas Guilfoyle’s three-part series, This is not fine: The International Criminal Court in Trouble.